Unleash your unique talent on Malaysia – audition online at bit.ly/2m2fame today! mFace is searching for the Next BIG THING in this country. Have you got what it takes? Great news for those who have a dream. It’s not limited to one: You can sing, dance, juggle, or joke, it doesn’t matter! All it takes is #2mins2fame, thanks to mFace. The mFace #2mins2fame talent show is giving aspiring superstars the opportunity an easy way to audition online. All you need to do is record the best 2 minutes of your talent, then get on to bit.ly/2m2fame and take a shot at fame. You know what, this could be you! mFace is also looking for talents who may not think of auditioning. 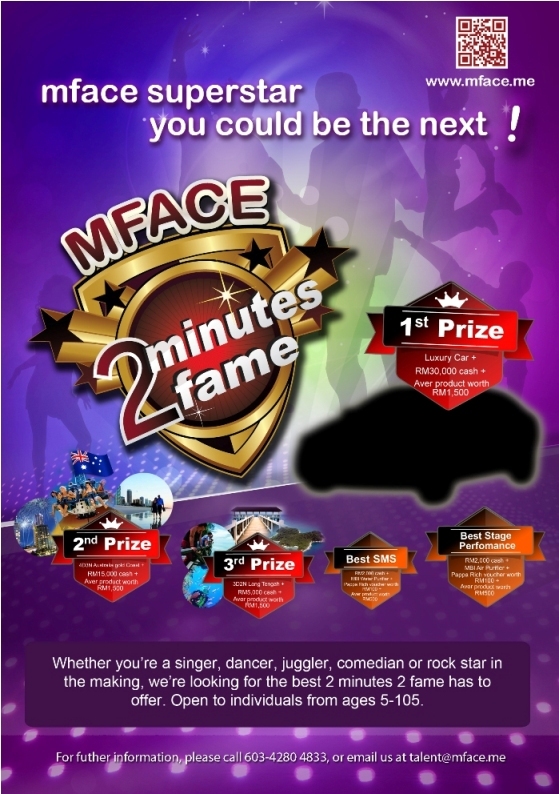 If you know someone who has a great talent, tell them about the mFace #2mins2fame Talent Show! You don’t want them to miss out, do you? While the mFace #2mins2fame talent show is opening up an avenue of possibility for Malaysian talent, it would be the Malaysian public that ultimately decides who will get through to the next round of competition. Now I’m sure we all want to know what the prizes are. The auditioners would be narrowed down to a select group of 18 most talented finalists which will be chosen by votes cast through smses, newspaper entries and online submissions. Online auditions will be open from May 5th to December 28th, 2012. Hopefuls will have the opportunity to audition by demonstrating their unique ability by performing it on camera. Videos are up to SIX (6) submissions per person or group. Newspaper, text message and online voting begins selected Saturdays immediately after each talent submission is made online, and 5 top-voted contestants would be picked each week. 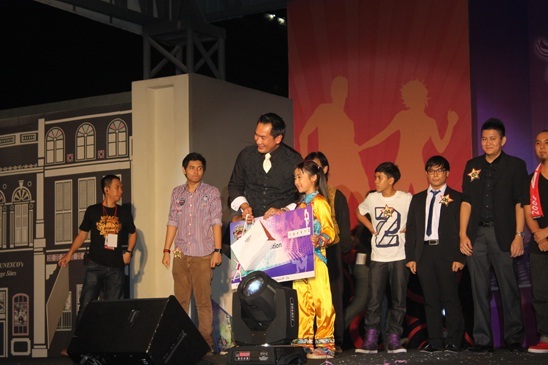 The TOP 20 contestants will appear on a live stage Final Round performance each month. Make your mark in the industry and become a household name. 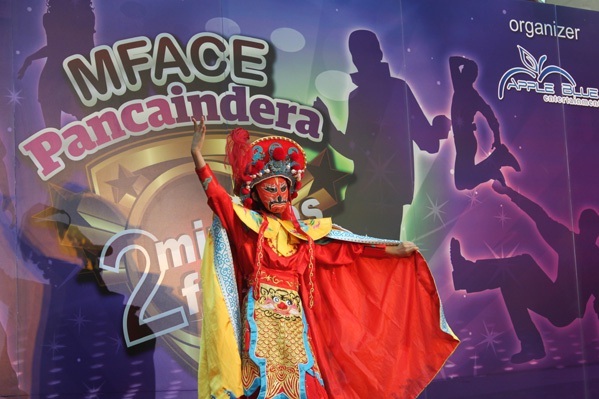 Video auditions for mFace #2mins2fame talent show are now open! If you have talent, it’s time to show it. Log on to bit.ly/2m2fame to record your audition. Auditions are open 24 hours, 7 days a week. Please check www.mFace.me for dates, rules, terms & conditions. Contest ends on December 28th, 2012. You can follow the action on Facebook.com/mfacedotme and Twitter.com/mfacedotme today. Rather good prices…this should see lots of people participating. Oops!!! Wrong post. This one…no, thank you. You go ahead. Have fun and good luck! LOL!!! Haha you should try this too! What’s your hidden talent spader from cooking? AH…you seem to have a few sponsored posts. How do you get sponsored posts? Always been curious about that! Are you with Nuffnang AU? You might be able to get advertorials from them. Basically it’s an ad company. Look up nuffnang.com.au and also try google Adsense and foodieblogroll. If you blog is hosted by WordPress it might be difficult to host ads but you can always try. Just ask some of the other bloggers who are hosting ads in Oz. I signed up for Nuffnang and then found out with WordPress it is difficult to host ads. Plus, you need a premium account. I will try and see what the other ones are like. Thanks for being so helpful! Yeah that’s the annoying part about wordpress. have you considering self hosting? Yes I have. I wanted to hit 1000 followers before self-hosting. You think that is a good idea? Or getting started right away? It’s up to you I guess. I still haven’t done mine yet. I suppose 1000 is a good goal.